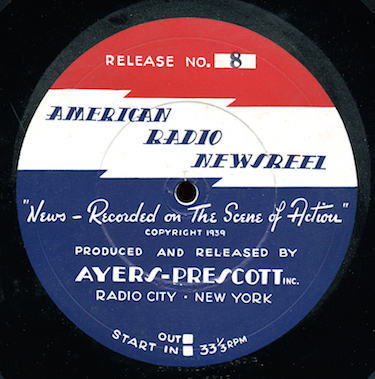 Rounding out the blog entries this week, the first episode I have in a short run a pioneering radio actuality series from 1939, “American Radio Newsreel”. 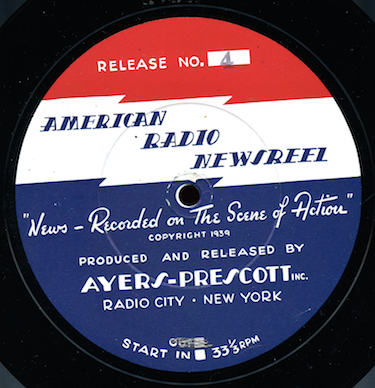 The series, produced and syndicated by Ayers-Prescott Inc, Radio City, New York, is much like an audio newsreel, interviewing various prominent figures of the day “on the spot”. 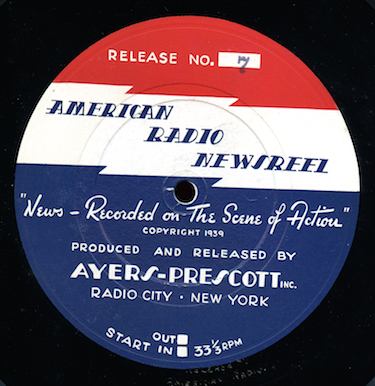 According to John Dunning’s “On the Air: The Encyclopedia of Old Time Radio”, the program was heard on about 300 stations and he describes it as one of the earliest attempts at “cut and edit” syndication, blending the announcer, interview clips, and music into a show that had to be produced, pressed on records, and sent to subscribing stations on a fairly short turnaround. Program 4 in the series appears to be a previously lost episode and, according to a log of the show at Goldin, likely dates to November or December 1939. Wyeth Williams, editor of the “Greenwich Time”, talks about his predictions on the political situation in Europe and how he comes to his conclusions. He predicts that the end of the War will come with the overthrow of Hitler from within Germany and that the US will never enter the conflict because of the dependence on other nations for our industrial might. A creationist, Rev. Dr. Harry Rimmer of the Central Baptist Church, who placed an ad offering rewards to anyone who could prove scientific inaccuracies in the Bible is interviewed, along with William Floyd, editor of “The Arbitrator”, who is suing him to claim the award. George Jessel is interviewed, telling stories about working on stage with Sophie Tucker. Jessel tells a “cleaned up” version of the old joke about Tucker saying she was “up to my neck in midgets” in one show. Football great Tuffy Leemans is interviewed by sports reporter Mike Blair about the differences between college and pro football and other topics. Theodore Roosevelt, Jr., attending the Bowl of Rice dinner to benefit refugees from the war in China is interviewed. The announcer is Bill Harding. Our mp3 was transferred from an original sixteen inch one-sided shellac transcription.